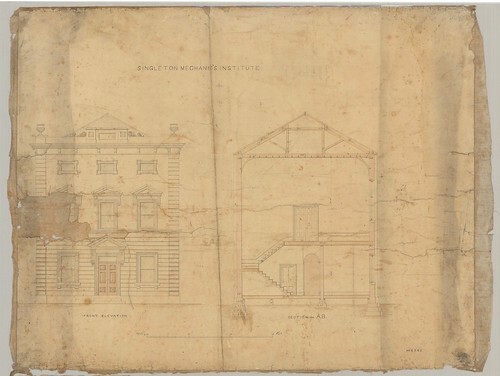 M6265 Early plans of Singleton Mechanic's Institute. 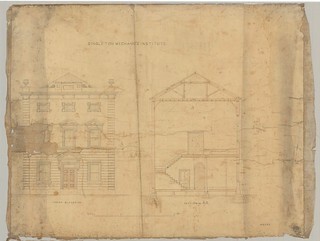 1) Front Elevation; Section on A.B. This image of the architectural drawings was taken from the Pender Archive of Architectural Plans. It can be used for study and personal research purposes. If you wish to reproduce this image for any other purpose you must obtain permission by contacting the University of Newcastle's Cultural Collections. Digitised in high resolution by the University of Newcastle (Australia) and shared freely with the global community with help from the Vera Deacon Regional History Fund. Donate today. If you have any further information about this image, please leave a comment in the box below.